Perfect for Work Trips! Would Love to Stay for Fun, too! This is the second time I have stayed at the Mulberry house and it was just as awesome as I remembered it. Not only is the whole place sparkling clean, but it is also so close to the tube, grocery stores, and bars & restaurants -- including those is one of my favorite areas of London: Exmouth Market. Oh, and communication with the management is so quick, easy, and helpful! I can't wait to stay there next time I'm in London! Great Location, comfortable, but poorly maintained. Fabulous location for getting around London while staying in a nice neighborhood with many nice restaurants. Clean and reasonably well equipped except for very poor WiFi and lack of hands-free shower, tub mat, and grab bar. Not as well maintained as it could be with broken entry system (main door entry), burnt out light bulbs/batteries. Will stay there again hoping needed improvements will be made. Enjoyed staying in Clerkenwell, an area we like and which goes back decades for us. Flat was clean, modern, well appointed, but rather hot in the London heatwave (no aircon, one fan). Only real gripe is lack of response from managers after a power cut - we had no way of knowing if the electricity would be restored when we returned at night, or if we could even get in to the building as entry to both doors was powered, not by key. So this rather undermined faith in the 24-hour response claim. What if there had been a serious emergency? And this is a tiny thing - but is a roll of kitchen paper too much to ask for? I stayed for 10 nights in flat 3, and had an excellent experience. The apartment is fully equipped with everything you need for an extended stay, and it is serviced daily. I organized a last-minute trip, and Angela was extremely responsive throughout the process, which made booking/check-in simple and seamless. Thank you for a great stay! Nice place, very clean very comfortable. The flat is even better than its photos show. I was shocked at how airy the front room is (vaulted ceilings and three tall bright double windows). The street outside is nearly silent, but the bars and restaurants of Smithfields and St. John St. are just moments away. For those of us that have to work, being a hop, skip, and a jump from Farringdon Station is very useful. Clean flat with new & modern furnature , security is high , wifi is fast , location is good . Simply I like it . A two month working stay. Flat was great. Largely just for my use but was a good space also when my wife and son joined me over the Christmas period. Good sized living area and good kitchen area. The wifi in the flat never worked and wasn't properly resolved although there was an immediate response to my emails. In fact I linked on to the internet from the flat downstairs in the end and that was satisfactory. All in all I would recommend the flat. It was private and very little noise from the other flats. An easy 30 minute walk into Oxford Circus where I was working. I'll definitely book again next time I'm working in London. Lots of pros and some cons: the location was convenient (right near Exmouth Market, good bus service and access to various tube stations), but the traffic on Farringdon was quite audible at all times. This is a corporate listing, not someone's private flat, so I expected a higher level of amenities. The flat itself was as advertised, colorful and fairly spacious, but all the furniture -- including "upholstered" chairs -- was washable, which is not particularly comfortable; and although everything seemed fairly new, the sofa sagged and one side of the bed even more so. Only one closet (in the bedroom) with two hanging rods meant one couldn't really hang up a coat or dress; there was no place to store a suitcase. The bathtub was nice and deep, but without a hold bar it was awkward and slippery getting in and out. Heated towel bar was a nice touch, but without any electric outlet in the bathroom and none near any mirror in the flat, hair drying/styling was awkward. The bathroom has only one inadequate shelf for toiletries, etc. The kitchen had a full set of dishes, utensils, and cooking equipment, but there was no bowl adequate for cereal in the morning. Housekeeping service was excellent, but I asked the management the first day to have the many burnt-out light bulbs replaced and that never happened. Internet service was fine. I was happy enough staying for a month, but I'll most likely look for another place next year. This is disappointing reading. We would have preferred to have been notified about the sofa whilst you were staying there since we went in after you had left to discover that it was broken which we were not aware of until that point. You did make us aware of the lights and I asked our housekeeper to deal with that, apologies if this was not done. 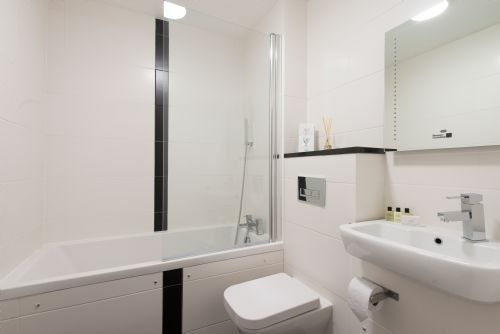 Due to UK safety legislation you cannot have electricity points in the bathroom due to the hazard of steam and electricity together (except for a shaver point which is allowed) and I am happy to read that the flat itself was as advertised. I am sorry if you found the flat noisy, this is not a complaint we have had before. It is rare to find birdsong in central London. Fabulous accommodation in the most convenient of locations. Suited all our needs. Well latex out with all the needed amenities for our stay. Comfortable, practical and convenient with a good size lift for luggage. 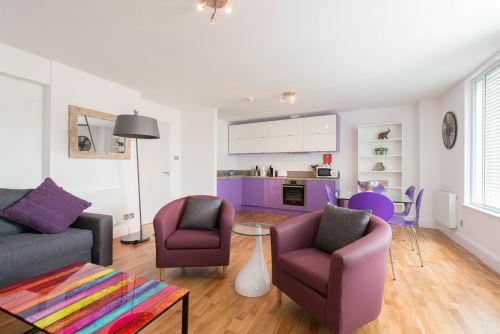 This is a lovely, modern, and spacious flat and is exactly as pictured and described. Angela was quick to accommodate my requests for slightly earlier check-in and later check-out times due to my flight schedules, which was much appreciated. 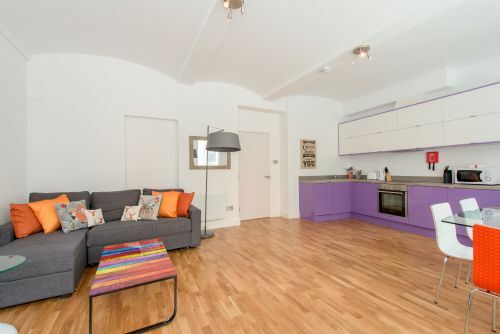 The flat is centrally located in trendy Clerkenwell, and is just a stone's throw away from fantastic Exmouth Market which is full of amazing restaurants and food market stalls. The Farringdon Tube is less than a 10-minute walk away, with Tesco and Sainsbury along the way. Quite convenient for getting groceries! Alexandra, who came by with fresh towels and linens, was excellent. There were only 3 issues that I encountered during my stay: the broadband for my flat did not work and I had to piggyback off of other flats in the building, which was unfortunately not always reliable - for the cost of the flat, broadband should be much more reliable especially if you are working, like I did during my stay. Also, the passageway doors between flats in the hallways make a lot of noise and slam shut, and unfortunately my bedroom was right next to the front door with these doors jolting me every time other guests came home late into the evening. Lastly, and most unfortunate, two constables knocked on my door 2 days before my departure to inform me of a break in to one of the other flats - to my surprise they informed me that there is no CCTV security system set up in the building. I wish I had known this as I had my Macbook air, passports, and other valuables laying about in my flat. Also, it would have been better to have gotten word of the incident immediately from the building management and not from the police - or at least to find a notice put up for guests to take precautions, much like my landlord does at my NYC apartment. Overall though, it was a fantastic stay and I am looking forward to returning! Thank you for a wonderful stay!! I had wonderful stay in the flat. I was there for a couple of months for business and enjoyed all the comforts of home with the convenience of a hotel. We would choose to stay here again and would certainly recommend it to others. Convenience to transportation and proximity to supermarkets are essential to us. Both criteria were met with this flat. 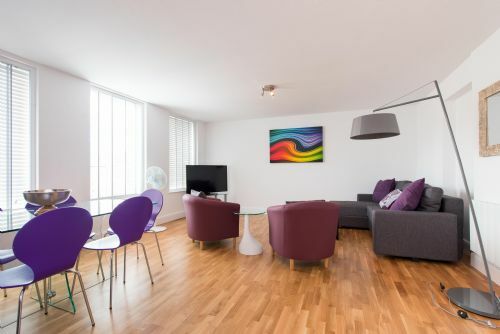 We chose this flat because it offered a large living and kitchen area, and it was positioned right in the heart of Clerkenwell just off Farringdon Road. It was a good choice. Travel links are excellent to all parts of London, and there is a superb selection of restaurants in the area. The flat is in a very pleasant building, and it has all the facilities you would hope for in your own home. The cleaning and maintenance services are also excellent. Lovely apartment with a great host. She was really solicitous and responded to concerns asap. Very clean and nicly furnished. I would come again! Thanks for that! Really nice and centrally located. Highly recommended!! !, really nice place, professional service and is centrally located, close to great eating options and places to shop. Near to tube station.